Thinking about changing up the way you vape pretty soon? Say no more because this AIO pod system will most likely be one that you will become a fan of almost instantly. VapeAnts is a brand that has introduced us to a couple of different products, and many people fall in love with almost everything that they release. Check out their fan base because it is pretty big. The E8 3.7V Pod System is the kit that will have you feeling thankful you can bring it around with you everywhere you go. It will have a compact size so that it easily fits in your pocket. It is a draw activated pod system, so just take a pull whenever needed. The pod system has a voltage output of 3.7V and a battery capacity of 350mAh. With this amount of battery life, you might be all right if you leave your charger at home. However, if you do have to add a little energy to your pod system, it will only take about 40 minutes for you to have a complete charge and be ready to go. The pod capacity will be a good amount of 1.2ml, so you will most likely be puffing away from a while. 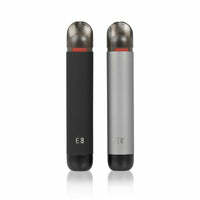 The packaging includes two pods, one with a coil resistance of 1.5ohm and another with the resistance of 1.8ohm. Choose the best one for you and start vaping like there is no freaking tomorrow.